Welcome to the 32nd edition of the Carnival of Divided Government- The duo et trîcênsimus June 15 Edition. DWSUWF has posted many special editions of this carnival over the last few years, including the recent Special St. Patrick's Day edition, Special Chinese New Year Editon, Special Bad Attitude Election edition, Special Halloween edition, etc. Today we post the "No Special Day" edition , as we are more than a bit late for the originally planned "Special Memorial Day" edition. This is best. Our carnival is a bit too cynical and flippant for as somber a holiday as Memorial Day. Of course, as this is the first "No Special Day" edition in over two years, this edition is more special than all the others. As explained in those earlier editions, we have adopted Latin ordinal numeration to impart a patina of gravitas reflecting the historical importance of the series. In this the Carnival of Divided Government duo et trîcênsimus (XXXII), as in all of the CODGOV series, we select volunteers and draftees from the blogosphere and main stream media writing on the single topic of government divided between the major parties (leaving it to the reader to sort out volunteers from draftees). Consistent with this topic, the primary criteria for acceptance in the carnival is to explicitly use the words and/or concept of "divided government" in submitted posts. A criteria that, to our endless befuddlement, is ignored by many of the bloggers submitting posts, which sadly results in DWSUWF reluctantly ignoring their fine submissions. "High-church moderates like to claim that a government with the power split between the two parties is desirable. They even claim sometimes that the voters consciously choose divided government, or that they are sending a message that they want sensible compromise and are tired of partisan bickering, etc., etc. Moderistos do not explain how a particular voter would go about doing these things. (How would you even know which way to split your ticket to make sure that you're not just canceling out the votes of a fellow divided-government enthusiast?)" Interesting. Apparently DWSUWF is a "high-church moderate." I don't even know what that means. More to the point Michael - while I have no idea whether many (or any) voters "consciously choose" divided government, I know they should. And it is just not that hard to figure out how to vote for divided government. This particular "moderisto" divided government advocate has been explaining how to vote for divided federal government for a number of years now. It is really quite easy. In 2004, the divided government vote was obvious. It was a vote for John Kerry and failed. In 2006, the divided government vote was obvious. It was a straight vote for Democratic party legislators and succeeded. In 2008, the divided government vote was obvious. It was a vote for John McCain and failed. In 2010 the divided government vote will be a straight vote for Republican legislators and will likely fail to achieve that goal, but will hopefully close the gap in preparation for 2012. In 2012, the divided government vote will be for Republican Senators, and/or the Republican nominee for President. It very well may succeed, with Republicans retaking either the White House, or (more likely) the Senate, with the Dems retaining control of the House of Representatives (and maybe the presidency). 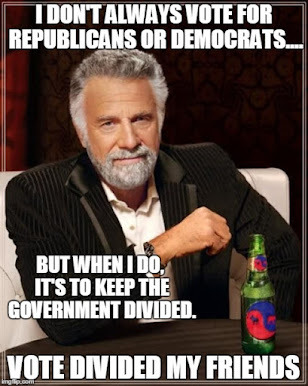 If the "divided government vote" is not obvious, if reasonable people can argue about what the correct "divided government" vote should be, then there simply is no "divided government" vote for that election. In that circumstance, the moderate/libertarian divided government voting block would go "free agent." There are several easily identifiable situations where it will be completely obvious that there is absolutely no divided government vote. As a hypothetical example: Although the Democrats structural advantage in the Senate race in 2010 make it extremely unlikely that the Republicans can take either house, if the GOP were by some miracle able to retake the Senate, and the Democrats hold the House of Representatives, we would go into 2012 with a divided Congress that is likely to stay that way. This means the presidential vote in 2012 would have no divided government preference (assuming that historical incumbent advantages hold.) It simply does not matter which party the president belongs to, as the congress and the government would still be divided. In that case, the moderate/libertarian/dividist vote becomes "free agent" with a counter-intuitive preference for incumbents. Whether we can succeed in restoring the greater fiscal responsibility and better governance that comes with divided government will depend on many factors. A critical factor will be whether "moderistos" of good conscience understand why it is important, and vote to make it happen. At least this blogger will continue to do what he can to promote the divided government voting heuristic. Hope this clears it up for you Michael. "In the present age, we have experienced again the consequences of unchecked, one-party dominance. From 2001-2007, Republicans controlled both houses of Congress and the White House. At the height of its power, following the 2004 elections, Republicans had a 55-seat Senate majority and a 232-seat House majority. Some party leaders got carried away and pursued policies that grew their own power at the expense of American taxpayers. Their unlimited power led to runaway spending, an explosion in obscenely wasteful and parochial earmarks, a lack of transparency, and once again corruption that sent several Congress members to court and some to prison... Over the past five months, the Democratic monopoly has expanded the federal government by historic proportions. It began with further taxpayer-funded bailouts of Wall Street and the auto companies, then extended the bailout fever to the housing industry. After campaigning on a promise to end the Republicans' tenure of irresponsibility, full Democratic control in Washington has produced policies that reward rampant irresponsible behavior and penalize innocent and responsible taxpayers who are forced to foot the bill. Still, there's more. A unified Democratic government passed a partisan $787 billion stimulus bill and another $410 billion spending bill. After promising to end the Republican tenure of pork-barrel spending, these massive bills included titanic lists of pork projects. The projected budget deficit for the fiscal year 2009 grew to $1.8 trillion, or a shocking and nearly unprecedented 12.3 percent of our gross domestic product. They then proceeded to pass a new record-breaking $3.6 trillion budget for the upcoming year. Unchecked power pushes parties to excess regardless of which party is in power." Too true. But unless a meaningful percentage of the voters ( 5-10%) start voting based on what politicians do as opposed to what they say (even if said politician is really really good at crafting and delivering what they say), we are still going to suffer the abuses, fiscal irresponsibility, bad governance and excesses endemic to single party rule. "..when presidents are not faced with "hostile majorities" in Congress, they can increasingly count--especially if Republican--on the lemming-like loyalty of congressional majorities who are especially delighted to provide not an ounce of the oversight that the naive might believe attach to a separation-of-powers system. And, of course, even when George W. Bush was faced with divided government in 2007-2009, he was still able to exercise quasi-dictatorial powers with regard to military and foreign policy. But enough of Bush bashing. After all, the President who seems determined not to hold any high-ranking member of that Administration accountable for disgracing the country and making us less safe to boot by adopting torture as a national policy is Barack Obama, to whose campaign I contributed and for whom I happily voted (and whose presidency, overall, still leaves me delighted). But surely we should recognize that the American version of "constitutional dictatorship" is built into our system and not simply a function of character. " It strikes me as odd that Professor Levinson still manages only the most perfunctory expressions of concern at the identical exercise of quasi-dictatorial powers when it is this administration issuing edicts as opposed to the last. And as far as the "lemming-like" congress, I am failing to see the distinction that Levinson discerns between the "lemming-like" current congress and the "lemming-like" Republican congress under GWB. I can only surmise the good professor feels it is reasonable to be "delighted" with a "constitutional dictator", as long as he is in the right party. "A glance at the annual change in the U.S. public debt since 1940 suggests the abandonment of fiscal responsibility can more easily be blamed on the ascension of supply-side economic doctrines with the election of Ronald Reagan in 1980 and the popularity of tax cuts, rather than the lack of divided government from 2001-2006. Using the Welches´ questionable logic, one could just as easily have argued the opposite point - that divided government is detrimental to the economy. In the recessions of the early 1980s, the White House and Congress were controlled by different parties. The same can be said for the 1990-1991 recession. The 1992 elections when Bill Clinton won the presidency and Democrats gained control of the House and Senate initiated a decade of prosperity and economic growth. So which is it? I think the answer is there is no correlation between economic prosperity and whether the U.S federal government is divided." Like any good partisan, the professor does not permit facts to get in the way of a grand sweeping conclusion that confirms his partisan bias. There is a clear correlation between divided government and reduced rate of spending increases and growth of federal government. This has been documented by economists like Niskanen and Slivinski among others. I actually thought the correlation might have been broken when Obama took office, and indeed it would have if Obama had lived up to his moderate campaign rhetoric. While the rate of federal spending increases under the last two years of divided government in the Bush administration were less than the previous six years of profligate spending by the single party Republican government, it certainly was still an easy target to beat if Obama chose to demonstrate any inkling of fiscal responsibility. He did not. Instead he chose to steamroll the Democratic House of Representatives stimulus pork barrel spending plan through Congress and the wildly irresponsible massive deficit increases of the Democratic budget, saddling the country with back breaking debt that cannot be repaid without devaluing the currency. His disingenuous rhetoric about halving the deficit and advocating "paygo" is laughable after forcing through a budget that quadruples the budget under a suspension of "paygo". But he gets a free pass from the professor. After all, as the professor concludes in his post, it is really not about facts or policy, but "What matters is the INDIVIDUALS in positions of power...". In other words, everything is ok, as long as Obama does it. Even if it is the exact same or worse policy as George W Bush. "I am not upset with political trends because I want Republicans to win. I am upset because I foresee a one-party state. Even if neither party is particularly libertarian, gridlock and competitive checks and balances are better for libertarians... as hard as it is for many people to admit it, the political equilibrium of competitive balance is gone for the next decade. For now, the only two elements of the political system are Progressive Corporatism and The Resistance. And the latter does not amount to much yet." FWIW professor, you can count DWSUWF in The Resistance. It still does not amount to much. Yet. "There is also some evidence that unified government is less libertarian than divided government (see here and here for starters). I should add, though, that the effect is not huge, and Singapore is a striking counter-example. Nevertheless, I disagree with Arnold's claim that one-party democracy is likely to happen in the U.S. He assures us that, "it is quite easy for a one-party government to emerge when there are ethnic blocs and a large public sector relative to the private sector." Small comfort, but a comfort nevertheless. "It might be that independent voters think back fondly on the days of divided government, when gridlock protected them from political extremism and the passage of every bad idea that popped onto the majority party’s agenda. It may be that all that spending and debt really has rubbed them the wrong way. Or maybe all that “We won, lock out the Republicans” stuff isn’t what they had in mind." "Quite an interesting trend if this poll is not an outlier. Interestingly, the same thing happened after Bill Clinton was elected President. In 1994, the first election after Clinton’s 1992 election, the GOP captured the House majority for the first time in over 40 years. 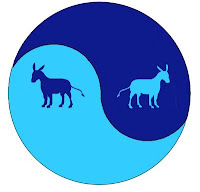 Is the reason that American voters prefer divided government with no one party in complete control or has there been a Democrat, Obama overload?" The Republicans likely are too deep in a hole to climb out in the mid-terms, but if they can narrow the gap it will bring us closer to a divided government in 2012. However, it would be very helpful for the GOP to follow the first rule of holes - stop digging. Divided government occurs when one party does not exercise control of both the executive and legislative branches. As observed by Professor Levinson, constitutional separation of powers break down when "lemming-like" majority Congressional Democrats abrogate their constitutional oversight responsibility over a Democratic President, as is happening now, just as when "lemming-like" majority Congressional Republicans abrogated their oversight responsibilities under President Bush. Without divided government, only the Judicial branch offers any hope of imposing constitutional constraints on the the power of the presidency. After eight years of Bush judicial nominations, the silver lining under the dark cloud of our current single party government was the prospect of balancing appointments to the judiciary in general and the Supreme Court in particular. As I've said before, my fervent hope is that Obama will appoint judges who will declare many of his administration's actions on civil liberties unconstitutional - particularly in the area of habeus corpus, search and seizure, surveillance, and detentions without trial. To that end, based on what I have seen thus far in the MSM, DWSUWF supports the Sonia Sotomayor nomination to the Supreme Court. The nomination has prompted some disparate divided government musing across the sphere. "As I have outlined in my essay in the Northwestern University Law Review, the traditional indicators of political constraint in this process–such as the presence of divided government, a short time until the end of a President’s Term, the preferences of the median and filibuster pivots of the Senate, the approval ratings of the President, and the criticality of a particular nomination to the composition of a court–all pointed in favor of a relatively unconstrained choice for President Obama... it is extraordinarily likely that Judge Sotomayor will be confirmed in time for the first Monday in October." "Supreme Court Justice David H. Souter on Wednesday warned that America's civic core is floundering in an address to the nation's judicial leaders, including two women considered potential successors for the retiring justice. Mr. Souter said the nation's troubles in educating citizens about the importance of democratic principles and the philosophy of divided government are a threat to democracy. "It is being lost," he said Wednesday afternoon at Georgetown Law School. "It is lost if it is not understood." Kane Rove’s memory’s certainly short. Based on views that they failed to support. Kane’s memory is equally short. Based on views that she failed to support. "I’ve been following Divided We Stand, United We Fall for quite some time now - he contributes to The BoBo Carnival of Politics frequently. 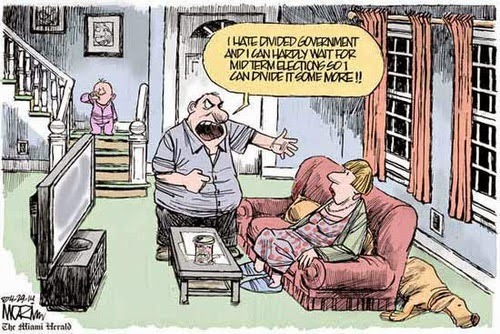 The premise of his blog is that we should keep the Federal government divided. We should in no way ever allow a supermajority in the government as it will cause this great nation to fall, and fail. No time like now has this ever been proven to be more correct... If you are either a Republican or a Democrat and you have found that your party no longer represents your values - the best solution now is to become an independent... The solution is to shed the parties and vote as an Independent or find one of the “third-parties” out their that is actually closer to your own values. The Democrats and the Republicans are both taking America down the same path of destruction and none of them have a backbone any longer. The two-party system is corrupt... It’s time for we regular everyday Joe Schmoe Americans to rise up and let D.C., local, and state politicians know that we want our country back. If our votes don’t matter to them any longer they will no longer have our financial support either. We will show them with our votes at the ballot box and we’ll reject everything they stand for. We need to make them fear us." Agreed. An interesting element here, is that in our partisan polarized political environment it will only take a relatively small percentage of true independents voting consciously and consistently for divided government to make a big difference. Something for disillusioned Republicans and Democrats alike to consider. "During the course of the previous administration, both officials and their old-media shills demonized individuals who dared speak out against the Bush Doctrine as unPatriotic, unAmerican, and/or traitors. Now we are told by socialist scribes6 that dissenting against the “economic terrorism” id est the central bank manipulated credit crisis, is also unpatriotic. If we are no longer allowed to question or criticize the government’s domestic or foreign policies without being painted as homegrown radicals, is there any semblance left at all of our republic? Should I instead just pledge blind allegiance to President Obama and be content with my “right” to criticize a group of B-list celebrities or no talent wannabee singers on “Dancing with the Stars” or “American Idol” respectively?" Not going to happen. Not for Allison. Not for me. And with that we conclude this edition. Thanks for stopping by, and thanks for all of the submissions (on-topic or not). Look for the next edition of The Carnival of Divided Government XXXIII - Special "Be Late for Something Day" Edition on September 5th. Which I anticipate being late and actually publishing on Labor Day - September 7. 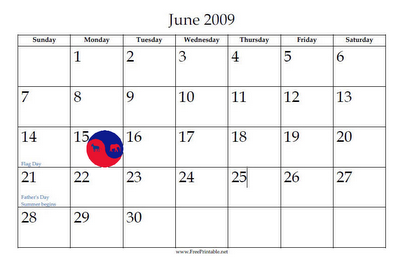 As we head in to the end of year, and in anticipation of the 2010 mid-terms, I expect to restore the monthly CODGOV publication schedule. In the meantime, submit your blog article at carnival of divided government using our carnival submission form. My turn to thank you now for the link back! This is really a great blog you have here. Hopefully, as a result of these last elections - others will begin to really understand what it is you are trying to say here.